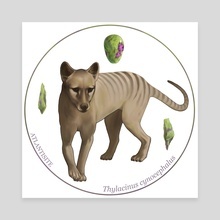 Thylacinus cynocephalus with atlantisite by Alisa B. 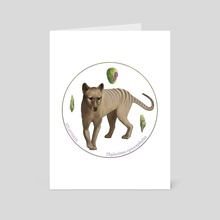 The thylacine, Thylacinus cynocephalus (also called the Tasmanian tiger or Tasmanian wolf) is a carnivorous marsupial sadly thought to be extinct; the last known thylacine died in 1936, though there have been unconfirmed sightings since then. The accompanying gemstone I chose is “atlantisite”, which refers to a combination of green serpentine and pink or purple stichtite found in Tasmania.